I’ am super excited to announce the Goddess Mantra Mondays. Setting my intentions using mantras and creating a sort of a theme for each week became something I love to do and have been doing for years now. It makes the whole week and each day more exciting. Knowing that my intentions are very powerful manifesting tools and so is my focus, I like giving myself these little mini challenges to channel my energy and attention in a very specific way. Using mantras and focusing on something specific I want to express or draw into my life creates a powerful expectation. This expectation always has a bit of and mystery to it. As soon as I set my intention I think: ” I wonder what this is going to attract into my life this week? “. More often than not this creates all kinds of amazing experiences and fun little surprises that perk up my each day. The universe orchestrates these experiences as a way of responding to where my energy is. And I love it! Trusting my decisions. Trusting my instincts about people and situations to make the best decisions in each moment. Trusting that my energy is in the right place to attract all the opportunities I need to create what I desire this week. Trusting my power to manifest all I want in life and trusting the timing of things that transpire. Trusting the Goddess within me to guide me in my daily tasks. I trust this part of me that is very intuitive, calm, centered, wise and very sure of herself to shop up when I face challenges and important decisions to make about my life and my career. I trust this part of me is always present and ready to step in when I entertain the thoughts of doubt and fear. We all meet and interact with many people every day. We can be affected by their energy, their words, their perceptions of ourselves and we can also get caught up in their stories and fears about what life can bring. This can be confusing, even painful and very distracting when we need to keep our energy up and stay focused on what is really important – our own well-being and our own life. 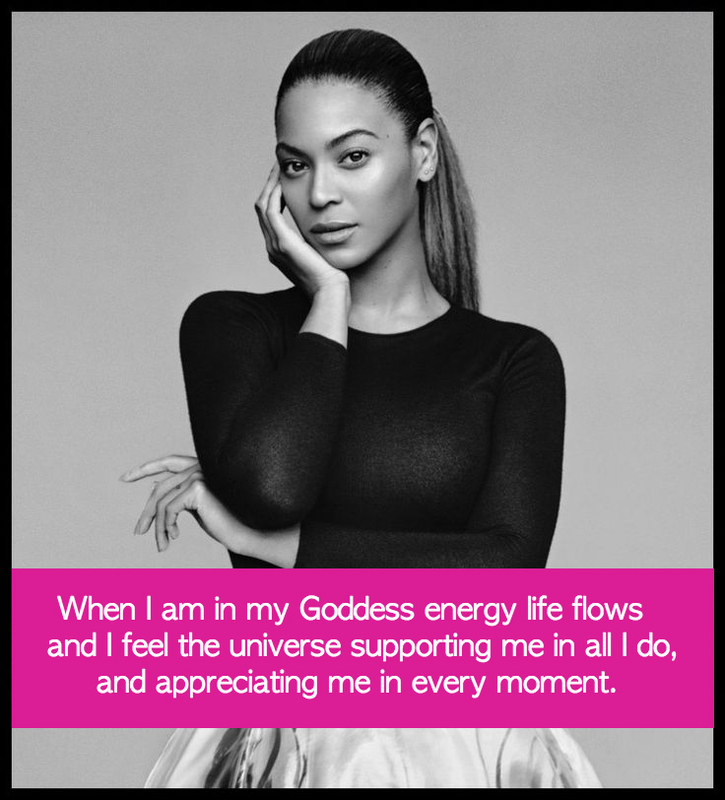 When I am in my Goddess energy life flows and I feel the universe supporting me, appreciating me and proving me with with endless opportunities to be happy, inspired and abundant in all aspects of my life. I find inspirations to tap into my Goddess power in different places. Sometimes it’s a great song or an article I find on-line. It can also be an image or a strong feminine personality like Beyonce. That is what inspired my this week. Have a magical week and share this post with other Goddesses in your life that maybe doubting themselves and not following their instincts and heart when it’s most needed ! Stuck in a rut and feeling like it’s impossible to get what you want? Break the spell with these 3 simple ways to upgrade your manifesting power.